Riku looked up from Namine, she did the same. "Narora. you came." She said. Narora nodded and looked to Riku. a slite stab of pain hit his head, but not to much. he held his head then looked up agian. Riku nodded. "yes Vent- i mean... Narora." Riku caught himslef from saying 'Ventus' instaid of 'Narora'. Aqua tilted her head. "so this is what is like?" Namine grined and walked up to Aqua. "its nice to meet you Aqua. before he fell asleep, Ventus told me alot about you. well maybe half of it. the other half was by Narora." She said shaking Aqua's hand. then she reached up to wiser in Aqua's ear. Aqua blushed when Namine finnished and walked back over to Riku. "So Narora. 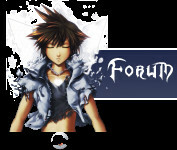 are you ready to see Ventus?" Narora nodded. "ya. i think i found a way to wake him up." Namine nodded and led them to the Pod Room.